Successful Email Marketing is one the most important strategies in Online Marketing, It allows you to stay in touch with your followers and keep them up to date with your content. Email marketing helps you build relationships with others in the same niche by sharing ideas and working together. No matter what kind of service or product you offer, It can be very essential for any business because it helps build a trust and loyalty with your customers which they will eventually convert into more leads and sales for your business. Building a solid email marketing system with a list of opt-in subscribers that are interested in what you are offering can guarantee you success in your business if setup correctly. In this post I will like to talk about the importance of having a successful email marketing system in your business and my opinion on the best service available. If you own any type of Business then an email marketing service is a must have. There are many email marketing programs available, Some are easy to use and some are more suited for advanced users. The idea is to find a Email Marketing Service that fits you, Has good customer support and has a FREE TRIAL available which is why I selected Getresponse Email Marketing. In comparison to other email marketing programs, GetResponse provides an easy to navigate interface. Also has the advantage to capture leads in any industry, it allows users to create email newsletters with custom landing pages. Additionally, GetResponse offers a simple set up that can have you sending out emails in just a matter of minutes. It’s price is very flexible and has packages available for any type of business big or small. Below are some of the features this amazing Email Marketing Service GETRESPONSE has to offer. 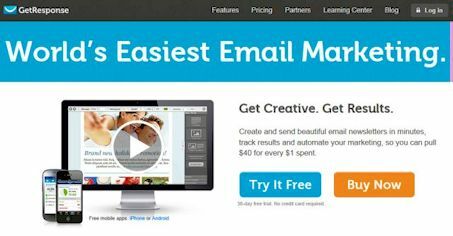 Email Creator – Create amazing emails that are compatible with any device, Customize your design. Subscription Forms – Customize your forms and share them on all your website pages to generate more leads. AutoResponders – Send Smarter Follow Up Emails, Turn leads into customers with ease. FREE Trial – Try it FREE for 30 days, No credit card information required. Landing Pages – Create high converting pages that engage. Super Easy To Use – Start Marketing your business in under 5 mins! Live 24/7 Support – Very Good! If you are stuck at any moment contact them and they will guide you step by step through the process. 99% Email Deliverability – Most of your emails get delivered, Better results and fewer bounces. Much more visit GetResponse for more info.. I have used many email marketing services in the past and none have caught my attention like GetResponse. It’s very simple to get started and set up your system. In a matter of minutes I had all my follow up emails scheduled and ready to be delivered. I was creating high conversion rate Landing Pages, The training videos and step by step guide just made it so easy to create everything. Navigating through the tools was pretty easy and incase you were having trouble, There Live 24/7 Support Team is available to assist you. They have a FREE TRIAL FOR 30 DAYSto test it out and you don’t have to add any credit card information for the trial. So you basically have nothing to lose by trying it out. If you are interested in trying out a Successful Email Marketing Service then Give GetResponse A Try For FREE.